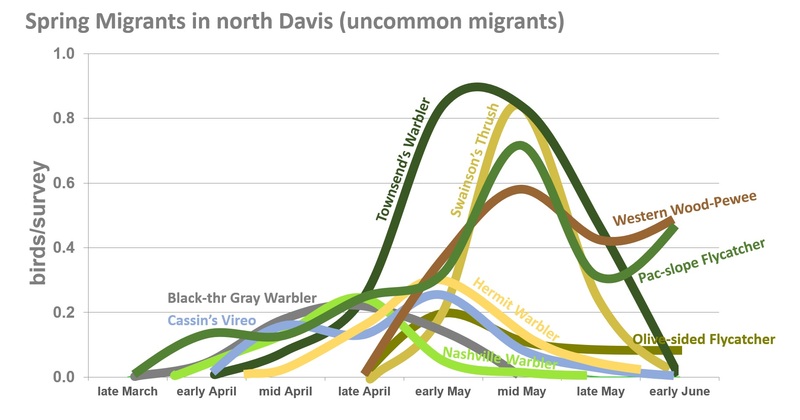 Compared to fall, spring migration is fast and furious. It ramps up thru April, peaks in early May, and then ends abruptly. Birds don’t stay long; they’re in a hurry. Rarities rarely last more than a day. And there are fewer birds than in the fall, winter mortality having taken its toll. But, like this Lazuli Bunting, the birds are in their best dress. Hampton, S. 2010. 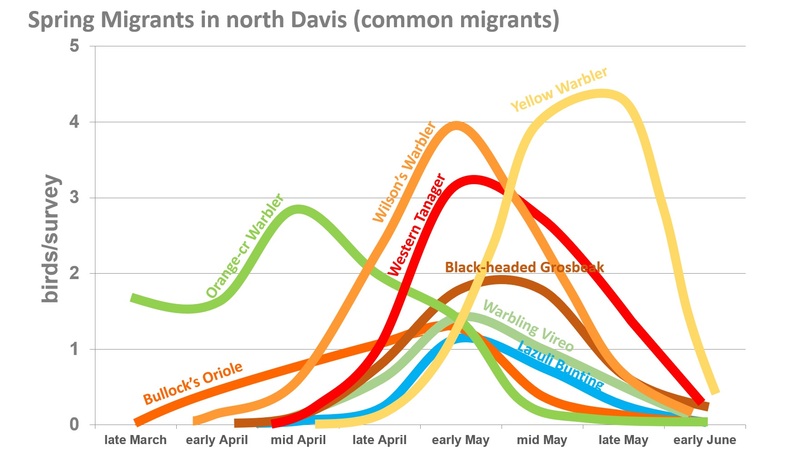 Passerine migration patterns in Davis, Yolo County—2000-2010. Central Valley Bird Club Bulletin 13(3): 45-61. Last fall, I posted a re-visualization of the data from that paper with regard to fall migration. Here is the spring version. I’ve divided it into two graphs, one for more common species (peaking at 1 to 4.5 birds per survey), and another for less common migrants (less than 1 per survey). A “survey” here is basically a morning walk lasting about 35 minutes. This was for my little route in north Davis (where the eBird hotspot is “North Davis Farms Subdivision”). For other locations in the Central Valley, even nearby ones, I would expect the numbers and relative abundance to vary a little. For example, I see a lot more flycatchers at Babel Slough and Grasslands Park than are reflected here. Putah Creek near Pedrick Rd, a current favorite of birders, generally has more birds than is shown here because it’s a larger area, birders spend more than 35 minutes when they visit, and the habitat is slightly different. A large portion of the birds in my data are “heard only”. For additional details, see the full article linked above. I’m happy to provide my Excel spreadsheets of this data to anyone interested. Some species are more common in spring than fall. These include Hermit Warbler (above), Townsend’s Warbler, and Swainson’s Thrush (with a very narrow migration window in mid-May). I’ve also linked lots of the bird literature specific to Yolo County at my Yolo County Birding website; see the list of papers in the lower right corner of that page. On these graphs, I’ve left out the rarer birds, species that occur at a rate of less than 0.2 birds/survey (less than 1 out of every 5 surveys). These include Hammond’s and Dusky Flycatchers. It also includes Willow Flycatcher, House Wren, MacGillivray’s Warbler, Common Yellowthroat, and Chipping Sparrow, all of which are quite regular in the fall but rarely seen in spring migration. This entry was posted in Birding and tagged california, central valley, davis, graphs, migration, Putah Creek, spring, warblers by Stephen Carr Hampton. Bookmark the permalink. Your charts are fascinating – and beautiful. I wonder if I can find such a thing for my area (Toronto).